SightMax Live Chat is a live chat software program providing live website monitoring, live help and live support to visitors for sales and customer service. 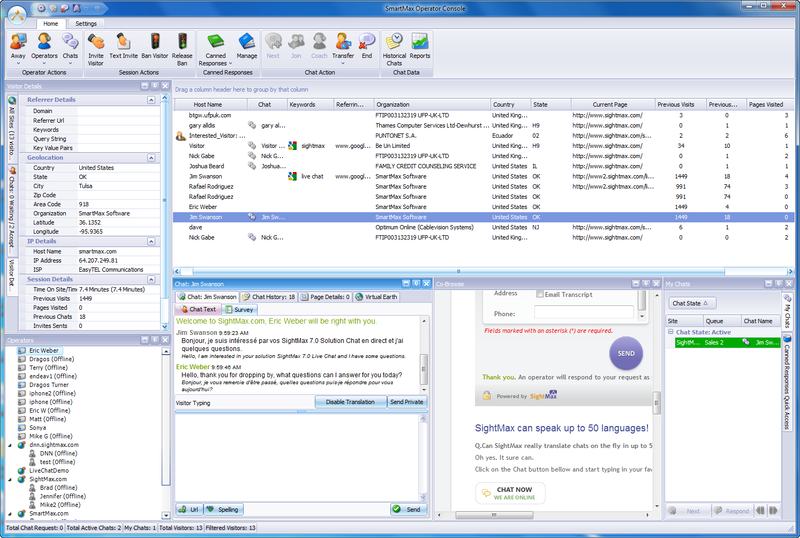 SightMax Live Chat has a host of exciting built-in features, these include: Instant Messaging between operators, Operator Chat Transfer, Multiple Chat Queues (ex. Sales and Support), Chat Conferencing and Operator 'Coaching', Operator Initiated Chat, Secure Chats, Canned Responses, Co-Browse. ...... has fantastic new chat design functionality, brand new on-the-fly reporting capabilities and more customization capabilities than ever before. SightMax Live Chat is an intelligent powerful software solution that enables you to provide real-time live chat support, increase your online sales with proactive engagement and reduce your overall customer service costs all at an unbelievable price. Trusted by SME's and Fortune 500 companies alike, no other live chat substitute provides the value and service-after-the-sale that we offer with SightMax Live Chat. SightMax Live Chat is more than just talk. BigAnt Live Chat is a web-based real time communication solution.Only $1. Absolute live chat support tool allows live chatting facility to all visitors. Qweas is providing links to SightMax Live Chat 7.5.0 as a courtesy, and makes no representations regarding SightMax Live Chat or any other applications or any information related thereto. Any questions, complaints or claims regarding this application SightMax Live Chat 7.5.0 must be directed to the appropriate software vendor. You may click the publisher link of SightMax Live Chat on the top of this page to get more details about the vendor.